Honda is recognized in the areas that matter most to the family buyer – safety ratings, fuel efficiency, and value. Honda builds more top safety rated cars than any other brand, and has been dedicated to incorporating intelligent technologies to increase your driving safety. Our highly trained technicians can maintain and repair that technology with cutting edge diagnostics and computer aided analysis. At Menke’s, your family and your Honda are in capable hands. 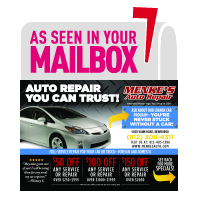 Menke’s provides a wide variety of services for your Honda, including pre and post purchase inspections, transmission service, suspension repairs, fuel injection services, and electrical diagnosis and repair. Our technicians participate in ongoing service training to update their skills in the newest makes and models of Japanese vehicles. Our friendly customer service representatives will set you up with a free loaner car for as long as your Honda is in our care. At Menke’s we go above and beyond expectations to guarantee satisfaction to our clients. Menke’s Auto Repair has consistently received recognition in the industry for their outstanding performance. We were chosen from a field of 165,000 auto repair shops to receive the “Top Shop” award from Motor Age. The Automotive Service Association presented Menke’s with their 2014 Best Dressed Shop and 2014 Facility of the Year awards. We’ve also received a “Super Service Award” from Angie’s List, and are the only AAA Approved Auto Repair Facility in the area. We strive to continue to build our reputation through honesty, competence, and customer care. At Menke’s our success is built on going above and beyond with our service. Our Master Certified Technicians are prepared to repair your Honda with skill and efficiency. Combine that with an ASE Blue Seal of Excellence, top technology, a history of accolades, and a staff with over two hundred and fifty years of combined experience, and you have to wonder what you’ll discover at Menke’s. Find out why we’re leading the way in automotive service and repair.